Welcome to the land of Sweet Sevens. Here, you can meet a tiny dice monster named Nom. To make him happy, the only thing you need to do is to combine the dice to sum up 7! 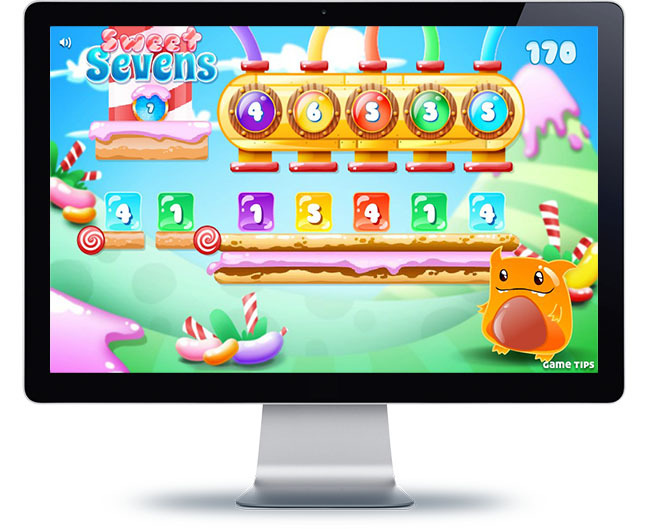 This way, you will be feeding the little monster with delicious and colorful sweets from the dice machine! As soon as he is full, he will reward you with extra points. What can be easier? Just feed him with as many combinations as possible in the time limit and earn extra points so you and Nom can both be happy! You need to match the dice available in the game field to sum up 7. If you can’t make this combination, you can press the blue button in order to receive two extra dice. You get extra points if you fill up the monster’s belly by collecting the dice for all colors or when you combine 3 or more dices with different colors. Just be careful with the time!